This post is part of a little series I've been writing about selling software. 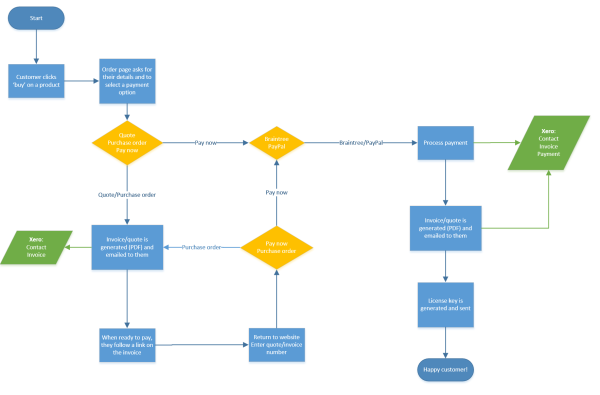 In this post, I want to talk about the customer experience of using resellers vs. processing orders yourself. This morning I went to fix a bug in our Java-based TeamCity plugin, when IntelliJ IDEA (the IDE that I use) told me that my trial license had expired. 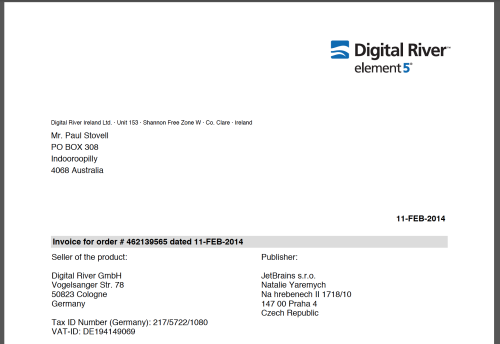 I like JetBrains, and I like their products, so I went ahead and bought a license. There was an invoice attached to the email, though, and it said Element 5, not My Commerce, and it had Digital River underneath. Confused? So am I. There are so many brands and logos involved in my order that I'm left feeling pretty unsure about who I actually gave my credit card to. Now, I understand that Digital River is a large company that has a number of different brands that they use to process e-commerce payments (and I suspect that they rename these companies often because they develop not-so-positive reputations). But to me, this lack of attention and confusion about brand identity comes across as very amateurish. At first I assumed the 24 hours was just a standard disclaimer, but as time went by and no license key came, I realized they were serious. Eventually, 5 hours later, my license arrived. I’m not sure why it took so long to email a license key. Perhaps their license algorithm relies on the unique entropy of Hadi Hariri doing the hammerdance? Who knows. Having to wait for something that should be automated was disappointing. But that confusing invoice from a company suffering an identity crisis did not leave me feeling like JetBrains particularly care about how I felt. Now, the point of this post isn't to bash JetBrains (I really love their products!) or even Digital River. This experience just reminded me of why I moved away from using resellers. While outsourcing to resellers might be attractive, and might even make commercial sense, the downside is is that you no longer own the customer experience. JetBrains have earned my trust with their brilliant products, and they have a nice website that explains the features in detail and convinces me to buy. But the buying experience was impersonal, confusing and disappointing. For Octopus Deploy, I previously outsourced order processing to SWREG (another Digital River company), and then quickly moved to FastSpring. I wrote about how I take orders with FastSpring previously. But in December I made a change, and decided to process the orders myself. I figured it would allow me to save a few thousand dollars a month in processing fees. And it would make reconciling with my accounting system easier too. But the real driving force behind deciding to process orders myself? I wanted to own the customer experience. I hated that FastSpring couldn’t actually create quotes and I had to issue them myself on their behalf (since the order will ultimately be paid to them). 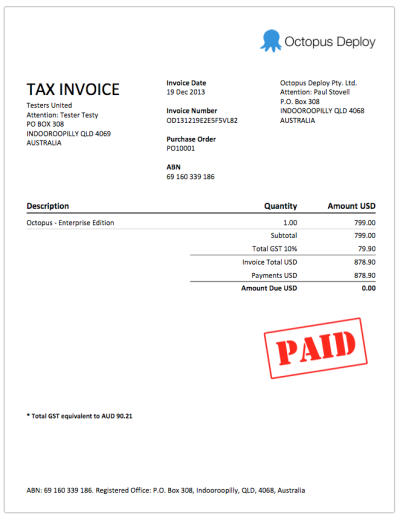 I hated that FastSpring’s invoices couldn't be turned into PDF's very nicely, since many customers ask for PDF invoices (the invoice email just linked to a web page with details). I hated that while my store was branded to look like my site, the invoice had FastSpring's color scheme and logo, and couldn't be branded. I hated that when large customers asked for extra documentation or tax forms, I had to send them off to someone else, because I wasn’t actually the merchant of record for the transaction. Now, FastSpring were great, and their support really is as good as they say. And I think at the time, they were the right choice: I didn't even know if anyone would buy my product back then, let alone have the time to implement order processing myself. And I'd recommend them to anyone else who is launching a product. But after 12 months with them, I decided it was time to grow up and begin to own the customer experience. For payment methods, we accept Visa/Mastercard (through a merchant facility with NAB, and the Braintree gateway), or PayPal. PayPal also lets customers pay with credit card without registering, so we use that for AMEX and other cards. 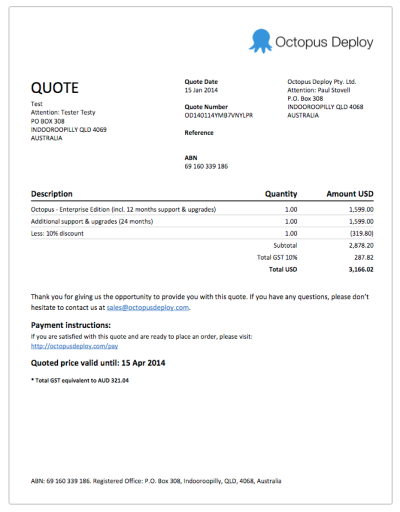 When a customer requests a quote or places an order, a background task sends the quote/invoice to Xero, using the Xero API. 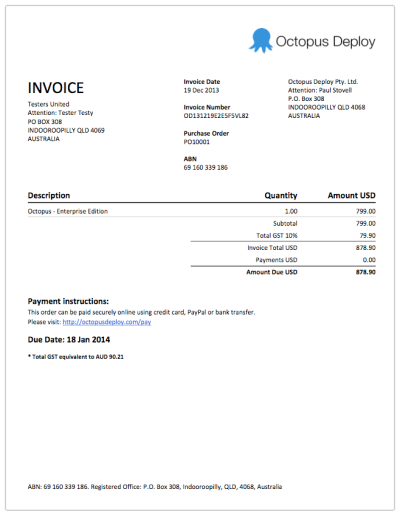 We then download that invoice as a PDF, and it gets attached to the outgoing invoice email. The license key is also generated and sent immediately via email. But there’s more. 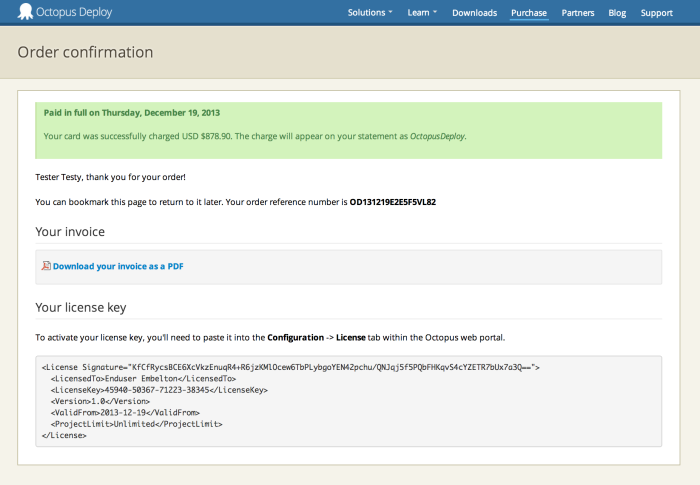 After purchasing/placing the order, if you stay on the confirmation page, the page will eventually refresh and show you your license key and invoice as a PDF. You don’t even need to check your email. It’s right there. We generate them in the background while you wait, but usually it’s just a few seconds. Firstly, I love that our invoices and license key emails all come immediately, and that they come from us, with our logos and no third parties. It feels clean and professional. And I love that customers don’t even actually have to wait for the email to get on with things. Finally, I love that everything pretty much reconciles itself. In Xero, as soon as a customer places a purchase order or pays an invoice, I can see it in my profit and loss statement. A few days later when I import the transactions, I tick some boxes and the reconcile is done. Our accounting system IS the invoicing system. Reconciling accounting with FastSpring and SWREG was much harder. The one downside to not using a reseller is that actually accepting payments is harder. FastSpring allowed us to fix prices in a dozen different currencies, accept pretty much any credit card, and even accept checks or bank transfers as payment methods (our US customers could mail a check to FastSpring, they’d clear it, and a few days later the order gets marked as paid). Now that we’re doing it ourselves, we’re a lot more limited. To price in different currencies you have to actually have a bank account and merchant facility in that currency (currently in Australia, only NAB can provide this). We price our product in USD, so we have a NAB multi-currency facility and a USD bank account. We can’t accept AMEX in USD because AMEX are, frankly, idiots. We have to send customers to PayPal to use their AMEX cards. And since our bank accounts are in Australia, it’s really hard for customers overseas to pay by bank transfer. It took about 7 emails for one of our customers in France to be able to pay us via bank transfer, and we lost about $50 in processing fees by the time it arrived. So far, though, limiting the payment methods hasn’t actually been that bad - sales have been growing despite reducing the payment options, and I’m getting emails occasionally from people about how they enjoyed the purchasing experience, which we never got with resellers before. If a small company like ours can do it, why haven’t a 300+ person company like JetBrains done it? Your Octopus Deploy license will be ready within seconds of ordering, yet it’s been 6 hours since I ordered my IntelliJ IDEA license and I am still waiting. They have 300 employees, we have four. When it comes to outsourcing, it’s always recommended to outsource your non-key competencies. And while processing payments might not be my core competency, I think it’s so essential for the customer experience. Purchasing is the last part of your sales funnel, and it’s too important to be left to the Digital Rivers of the world if you can help it.